This shot was taken back in late November. We had been working 30 to 40 foot flats catching Striper after Striper. I had just located this school and you can see on the sonar page use dropping a bait and egg sinker down into the school of fish [about 3/4 of the way across the screen]. 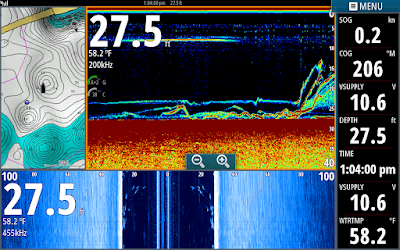 The white vertical dashes on the side scan are Stripers. This pic was taken the same day a few minutes after the first one and it shows us pulling a couple of downlines through a few Stripers. 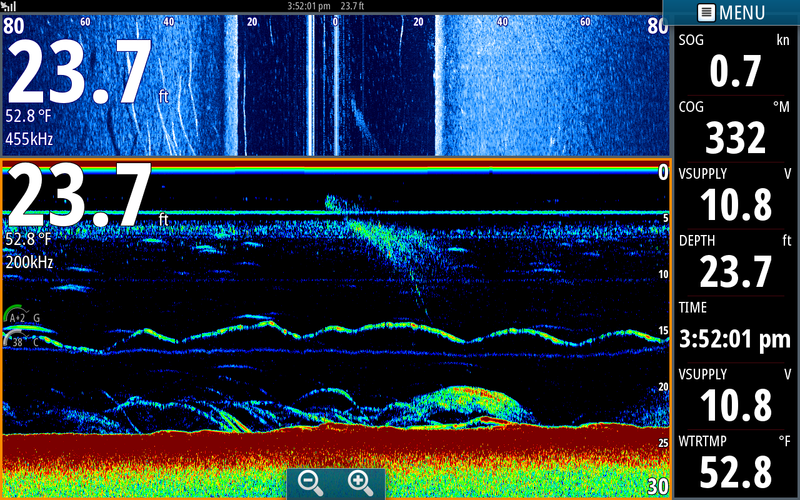 The baits are the horizontal lines on the sonar page. You can see on my chart that I had laid out a waypoint and was working around it. Later on that day the fish had moved up onto shallower flats. 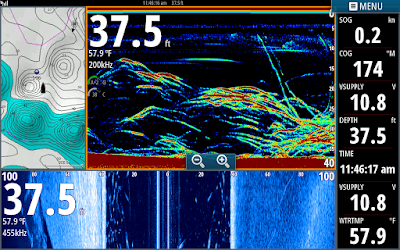 We are working a flat in 27 feet of water here with downlines and 3 of our baits hooked up. You can see us fighting the fish on the right side of the screen. This pic was taken this week. I took my grandson and his friend out for a couple of hours in the afternoon. 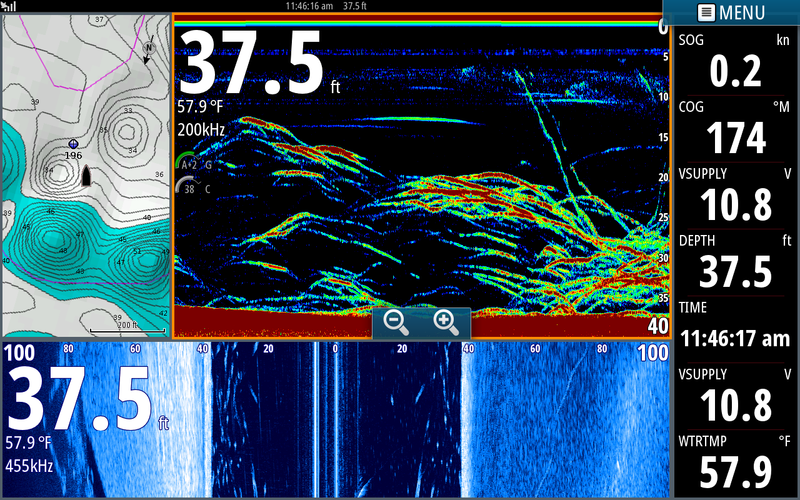 These fish were extremely active, we were catching them on boards and downlines at the same time. We caught 18 Stripers in a little over an hour of fishing. The pic below was taken just a few seconds after this one. In this pic we still are pulling downlines and boards. 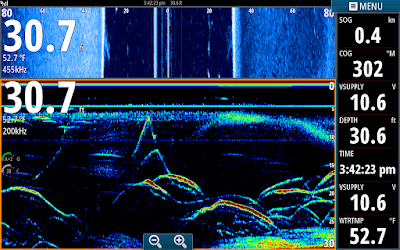 The light light blue horizontal line at 17 feet is our sinker and the yellowish line is the bait swimming above the sinker. 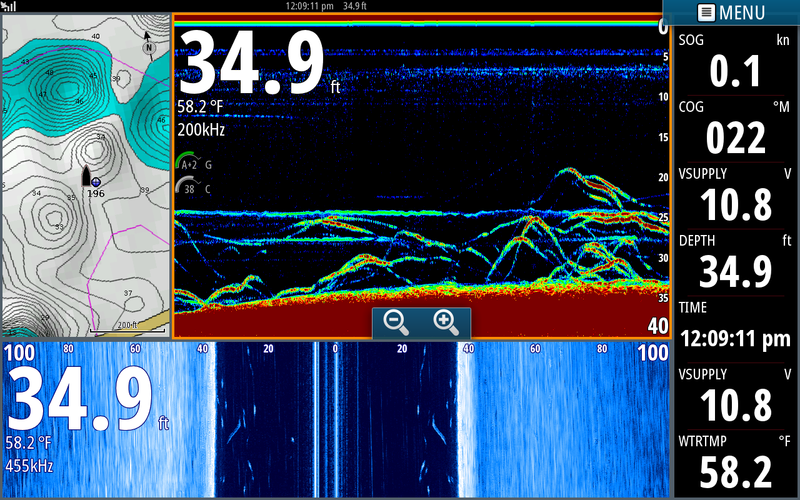 If you look out to the left on the side scan 40 to 60 feet you can see 6 or 8 Stripers with shadows behind them. I was pulling 5 boards off of each side and our 3rd, 4th and 5th board on the left side of the boat hooked up presumably with some of these Stripers. After boating the fish I went back in my history and waypointed the spot, turned the boat around and went to it. We finished out there hooking up with nicer fish. The water temps this year are warmer than usual and the weather forecast predicts warm weather for at least the next week. Stripers are very active now and will be feeding all over the lake. Look for the upper rivers to be very productive. 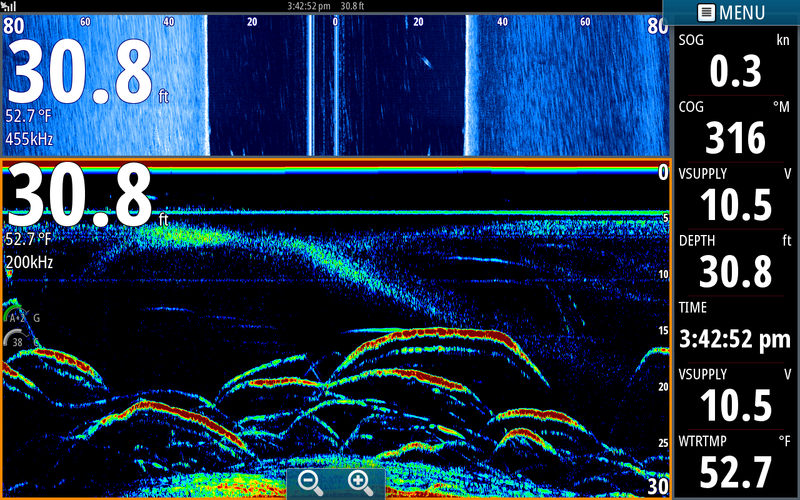 The stained water and shallow flats will warm in the afternoons and the Stripers should feed heavily up there. Jump fisherman will also have fun mid lake chasing the birds. The bottom three pics were taken this Sunday afternoon. I don't know if it was more fun watching the boys catching Stripers or watching 7 boats running from bird to bird. They would see a bird dive and fire up there motors and run right into where the birds were diving. They would make 8 or 10 casts then do it again and again. I hope they caught some fish but we did not see them catch any. They were competing against themselves to get as close to the birds as they could spooking the fish. 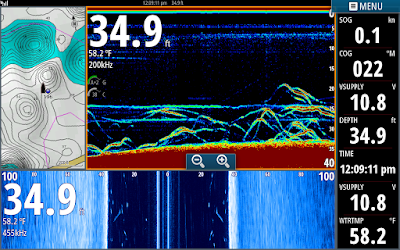 A better approach would be to stop at least 100 yards from diving birds and use the trolling motors to silently sneak up on the fish. Everyone would have greater success being stealthy and probably have more fun. December fishing should be great this year. Get out and "get you some".